During the evening... the history comes alive. The Above two pictures are the ruins of the castle where the blood countess was walled in, and where her crimes were committed. 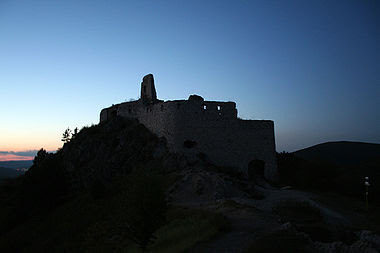 Čachtice Castle was its name and it was imposing and a vital castle. In 1708 long after Elizabeth was walled into her room there, the castle was plundered and left to fall into ruin. It is now a park due to the rare plants the area has. Still I wonder... what would happen if they worked their way through the ruins?